Welcome to the April 14, 2011 issue of the Food Allergy Blog Carnival! Thanks so much to Jennifer B. of Food Allergy Buzz for allowing me to host. Here's what's on your minds and in your stomachs this week. The subject dominating the news lately in the food allergy community has been the case of the parents protesting federally mandated accommodations of a peanut allergic six year old girl at Edgewater Elementary school. 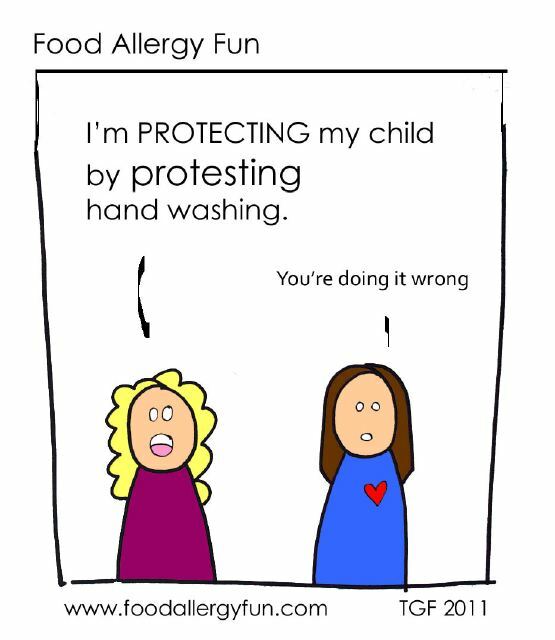 The entire situation may have been summed up best by this cartoon from the talented artist Tiffany Glass Ferreira of the blog Food Allergy Fun, where she manages her son's multiple food allergies with grace and humor. Collette Martin of Learning to Eat Allergy Free takes a look at the bigger picture in Precisely Why We Need to Raise Awareness, noting "The raging debate in Florida is a great reminder that the more people know (or don't know) about food allergies, the more controversy there is." Melissa from Confessions of a Dr. Mom is a non food allergy parent who understands the importance of Safety and Compassion for Children with Peanut Allergy. Thank you for helping to educate! In My Kid Is Special, Too* Libby of The Allergic Kid compares and contrasts the outrageous claims of the protesters with both her own son's food allergy plan and the one being criticized at Edgewater Elementary. Christina, The Substitute Chef, vividly describes the damage that eating wheat did to her health and shares the positive side of dietary restrictions in Living (and Eating) Gluten Free. Susan Arcelay may describe herself as the Average Allergy Mom, but in her post, Our First ER Visit from Food Allergies and Entenmann's Little Bites, she demonstrates how to advocate effectively for your child with medical professionals. Then she breaks down potentially misleading food labeling and shows why it is so important to follow up with manufacturers online or by phone. If you are afraid of the Epi-Pen or frustrated by ingredient labels, this one is a must read! Thanita of Vicky's Ickies explains how the "reasonable accommodations" standard for schools differs from the standard for workplaces in Reasonable Accommodations as It Pertains to Students Under Section 504 of the Rehabilitation Act, necessary information for parents of food allergic children. Elizabeth Goldenburg of OneSpot Allergy discovers important news for the nut allergic in Cetaphil Products: Tree Nut Allergy Warning. Jo-Anne, The Punky Mama, shares the heartbreak of telling your food allergic child "no" to other kids' treats in Cheese Curl Drama. This mama has food allergies herself, so be sure to get her perspective! Wendy of Taste of Allergy Free Living describes taking her kids to the local food allergy support group's annual food-free egg hunt in Egg-static at Easter. Egg-cellent. Just in time for Passover and Easter, Janeen, a wego health blogger, lists a wealth of restricted diet resources for traditional holidays in Share Your Favorite Allergy-Friendly Easter & Passover Here! Christine Pittman of the lovely food blog Cook the Story was kind enough to share her toddler friendly (and totally drool worthy) Portobello Mushroom Rafts from her post How to Have Your Mushrooms and Eat Them Too. 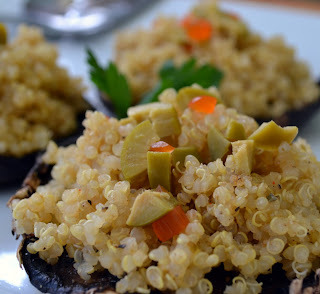 These quinoa stuffed 'shrooms make a tempting, gluten free side dish that can easily be made vegan by using vegetable broth for the chicken stock. In Bakery Style Oatmeal Cookies: Traditional or Gluten Free, the amazing Alisa Flemming of Alisa Cooks and Go Dairy Free takes this scrumptious vegan cookie recipe from Hannah Kaminsky of Bittersweet and makes it gluten free. Danny Brown, who writes about cooking for his daughter at Emily's Allergies, took on a real challenge. He created a recipe for Scalloped Potatoes without "gluten, yeast, mushrooms, dairy, eggs or nuts." Wow! 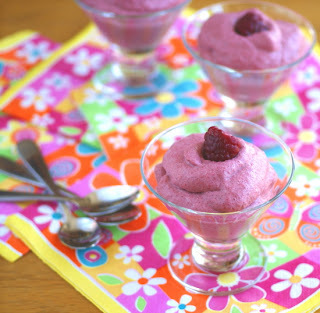 Ricki Heller of Diet Dessert Dogs created these colorful cups of mousse in Flash in the Pan: Strawberry Chia Fluff for Spring. 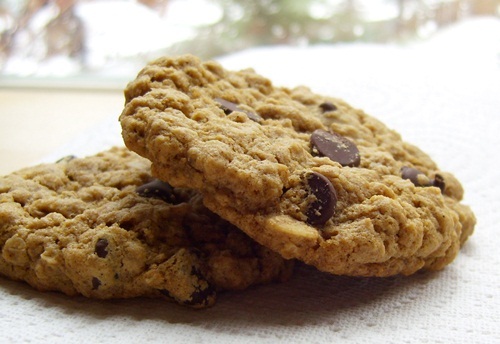 Not only are they vegan, gluten free and low glycemic index, they are also astonishingly quick to whip up. Ian and Jason of Sugarbomb Bakery, a dedicated vegan bakery in Asheville, North Carolina, share their much requested recipe for Easy Gluten-Free Chocolate Cupcakes on their blog for those of us who can't stop by! 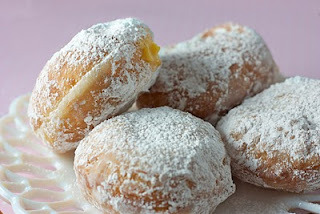 Meg of Speedbump Kitchen has succeeded in making the perfect egg and dairy free donut, a real challenge, in Paczki for All. I am simply in awe. That's it for this week's Blog Carnival! Be sure to submit your posts for the April 28th edition being hosted by Learning to Eat Allergy Free! Great carnival! I'm so happy to 'meet' so many new food-allergy bloggers here. 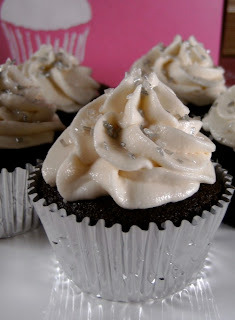 And thanks to all those yummy looking recipes, I'm already drooling on my keyboard! Can't wait to make 'em! Wow Libby! What a round up. Thanks for including my cookies! I really like your inspirational outlook - you have motivated me in a deep and sincere way.